Our Edmonton, AB, optometry practice leads the way in providing patients with healthy eyes and sharp eyesight. Whether you need vision correction or progressive treatment for eye disease, our eye doctor will treat you with a full range of professional eye care services. Patient satisfaction is our motto, and we aim to satisfy all your eye care needs – from simple to complex. Our friendly, accommodating staff will personalize your eye care to meet your age, vision requirements, and health condition. During your comprehensive eye exam, Dr. Barry C. Nolt will use first-rate skill and advanced diagnostics to inspect your eyes. Our office is family-friendly, and we provide eye exams for adults and children. With pediatric eye exams, we want your child to have a pleasant, positive eye care experience. Our friendly eye doctor will evaluate your kid’s visual system with a gentle and experienced bedside manner. If you have an ocular disease, such as glaucoma, macular degeneration, or cataracts, our eye doctor will monitor your condition to prevent complications and future vision loss. With the latest optometric equipment in our office, we ensure that you will receive precise diagnoses and treatment. Depending upon your personal requirements, your Edmonton eye exam may include OCT Scans, Digital Retinal Imaging, and Visual Field Testing. If you suffer from the irritating symptoms of Dry Eye Syndrome, we will assess your condition thoroughly to determine the cause. This is the best way to recommend effective dry eye treatment to alleviate your discomfort. Medicine advances rapidly, and our eye doctor keeps pace with all eye care developments. Accurate vision correction depends upon wearing the right eyewear and the right vision prescription. Dr. Nolt will perform detailed testing of your visual acuity, and our experienced optical staff will help you select the ideal eyeglasses. We will make sure that your eyeglasses and contact lenses support your vision prescription, feel comfortable, and flatter your face! When you visit our Edmonton optometry clinic, we won’t let you leave until you are fully satisfied. We aim to make the most of your healthy, comfortable vision! Latisse: Your Ticket to Thicker Eyelashes! 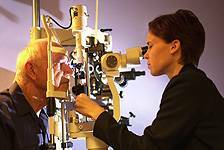 Do you need emergency eye care in Edmonton, Alberta? Dr. Barry C. Nolt Optometry provides skilled and effective emergency eye care in Edmonton and the greater surrounding area. With a 24-hour emergency number, we will always make sure you get seen quickly, whether it's during office hours or the middle of the night. If you have sustained an eye injury, have something in your eye, or experienced vision loss or abnormalities in your vision, contact us right away for fast, skilled, and compassionate care.